Beer Mythos. The Greek lager beer. The combination of Mythos' exceptional quality with its authentic, impressive, revolutionary personality, has led to its becoming the beer of choice for more and more consumers. And not only in Greece…Its unique taste even draws foreigners visiting our country, who ask for it by name. The fact that the majority of these are from countries with a strong beer tradition, confirms the potential of 'Mythos' beyond the borders of Greece - borders it has already crossed with success since it is available in a number of European countries as well as in the USA, Canada and Australia. Winning an award at the '2001 INTERBEER INTERNATIONAL BEER & WHISKEY COMPETITION' constitutes further confirmation as regards its reception beyond Greece. 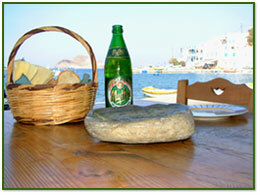 The company's mission is to make the Myhtos label well known worldwide, as ‘Fine quality Greek Beer’. The quality and commitment in company's agreements and products is the main benefit one can earn by including the Mythos beer in his company's portfolio.